More Visits. More Leads. More Sales. 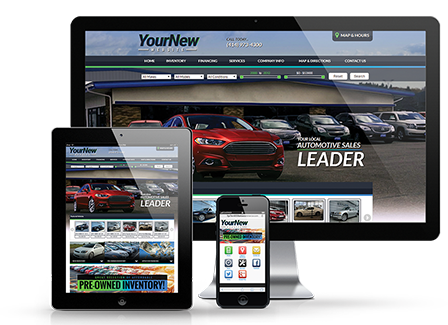 Looking for a powerful website platform that gives your dealership the edge it needs to compete online? Look no further. We've worked with dealers like you to build an auto dealer website platform that delivers more leads and converts more browsers into buyers. Discover the Auction123 dealer website difference today. Showcase your auto inventory with automated imports from nearly 100 sources, including DMS, service provider and dealer-provided imports, or customize it manually. Action-oriented imagery and user-friendly design put your inventory front and center to get vehicles seen by more customers. The customized service manager allows your site visitors to see all the services you provide on a single, easy-to-find page. Service quote request and appointment scheduling forms help generate leads, while financing forms help your customers get pre-qualified, moving them further along in the buying process. Your Auction123 Dealer Website includes a variety of additional tools and dedicated support that make keeping it up to date easier than ever.